I can’t decide if this camera is mind boggling or just overly simplistic. 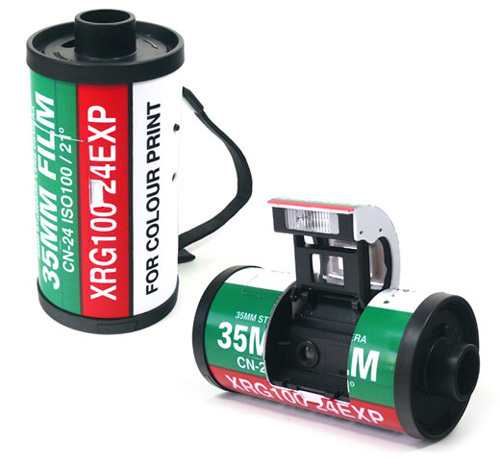 It’s mind boggling because it’s an oversized roll of 35mm film that’s actually a camera, that you use 35mm film within. It’s simplistic, because you’d always know what type of film to jam inside of the camera. It’d be really baffling if it used something besides 35mm film. It’s called the Transformer camera, but so far there have been no reports of it turning into a robot that attempts to save or take over the world. However, maybe if you purchase it and kept a close enough eye on it, something interesting might happen. That is, besides take pictures. Unfortunately, the camera might be a little hard to get a hold of for those of you that still enjoy cameras that use film and are looking to purchase it. It’s being sold in Korea and Korea only, as of now at least. There it sells for 27,000 KRW, which translates into about $20.